Since the court decision in the case of Public Storage v. Dubey, the self-storage industry has been put on notice that courts are not tolerant of facility operators' mistakes in wrongful sales. In light of this case, there are changes you should make to your sale procedures and rental agreement. Your business insurance coverage may also need to be upgraded to provide protection against wrongful-sale claims. 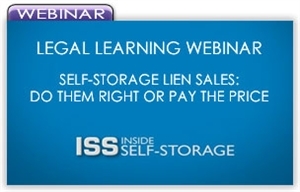 When it comes to conducting your self-storage lien sales, you need to clearly understand and follow a plan in accordance with your state self-storage statute. During this webinar, you’ll learn what that plan should include and common mistakes to avoid.